This isn't my pantry, but I thought it looked pretty cool. It is so organized and easy to find things. I love the doors on the pantry below. You can see all the spices so easily. It looks great, but wouldn't be too functional for me. I want my spices right next to the stove, where I use them the most. 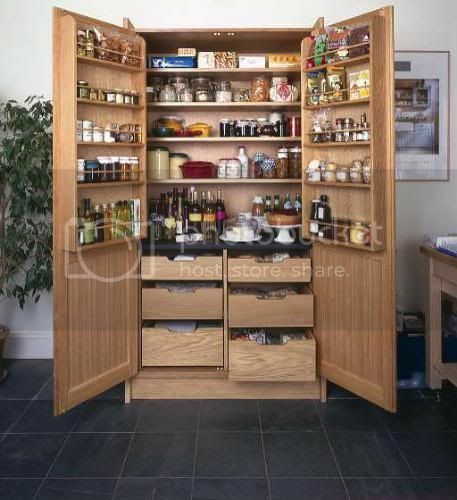 I would love either of these pantries in the pictures to stock up on extras of what I normally use. Try taking a week of shopping, and eat out of your pantry, freezer and fridge. If you have to shop, just buy necessities like milk and eggs. By doing this, you can use up things that are close to their expiration date, you can also see what you have and if it is sufficient to last you very long and have a balanced diet, and you can see what you need to add to have what you need if you had to live on the food in your pantry, fridge and freezer for an extended period of time. In the latter part of the summer, we ate the stuff in my freezer, so I could start fresh this fall. We still have just a few things left, but this helped me to have the flexibility to stock up on some things that I normally wouldn't have on a $50 per week budget. Take some time and think of a week or two and try a pantry challenge. If you are used to going to the store every day, then try to go every two or three days. I read about one woman that didn't go to the store all winter. She just lived on what she had. I would go crazy without fresh produce, but maybe she had carrots, apples, potatoes, etc. in a root cellar. Keeping things rotated and eating what you have is a way to save money. This is a great idea - but I do the whole Simply Being Mum style thing and clear out my fridge and freezer regularly. There's no meat that's not part of a leftover (which are lunches). There's no fresh vege or fruit either! But it's how I like it, less waste - and I'm in the same block at the grovery store and a green grocer. So it works. You are a great example! Maybe you can share some of your ideas that work for you. The biggest thing for me is buying perishables in the right quantities - so I use a butcher over the supermarket prepackaged meats. And with vege, I think about whether I can use more (if I'll be left with half-a something), or similar. I'm not so militant on condiments and the like, cause they have long use bys!